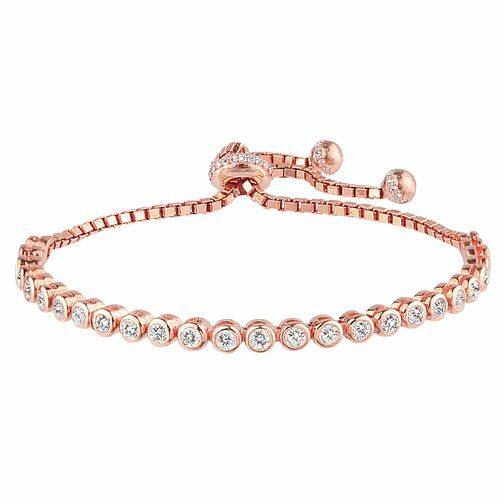 Unique and sophisticated, this beautiful rose gold-plated tennis bracelet is a charming addition to any outfit, taking you from day to night effortlessly. A beautiful piece that's sure to turn heads, on or off the court. Rose Gold-Plated Tennis Adjustable Bracelet is rated 5.0 out of 5 by 2. Rated 5 out of 5 by Anonymous from Elegant Bought this online as a birthday gift. Thought it would be bigger than it came but once put on the bracelet looks very sleek and elegant. Love it!